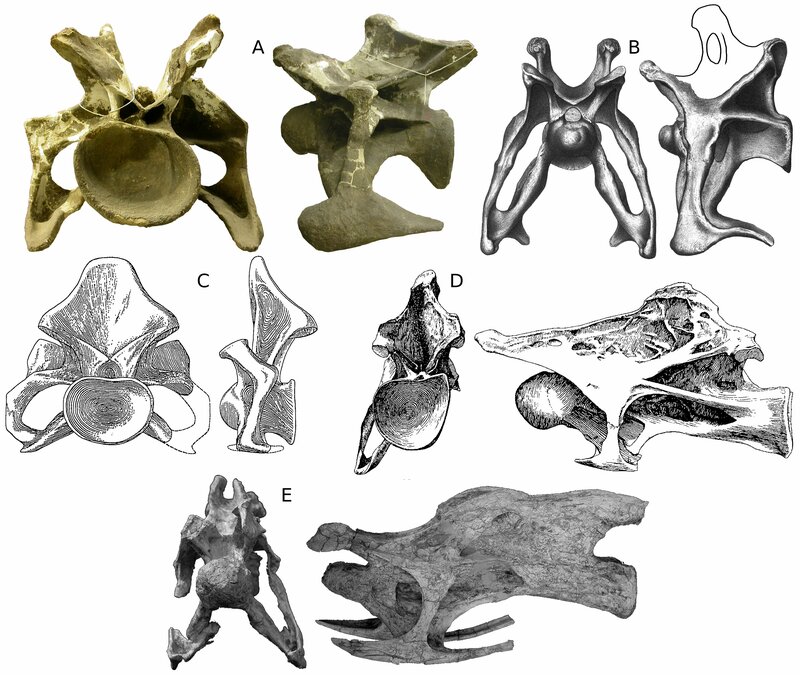 Can you identify these five sauropod cervicals? This is one of the figures from the as-yet last unpublished last chapter of my dissertation, slightly modified for its forthcoming submission to Palaeontologia Electronica. As you can see, it shows five sauropod cervicals, each one in left lateral and either posterior or anterior view. But can you tell me what they all are? Points will be awarded for getting the right taxon, the particular specimen, and the serial position, for an available total of fifteen points. I will award fractional marks as and when necessary (e.g. right genus but wrong species; serial position close but not quite right). And I might give bonuses for interesting and relevant historical asides. Do not look at other peoples’ answers before deciding on your own! I will leave some blank space at the end of this article, before the comments, so that you don’t see them inadvertently before you make your choices. Dave took the words right out of my mouth. Why is there a string tied around Specimen A? Dave: come on, come on — you must be able to get one or two of them! Top left- Camarasaurus ?supremus, based on the bifurcated spine, general robustness and fact it seems like a photo from an American museum. Top right- Apatosaurus ?ajax, since it’s also robust and bifurcated with a crazy low cervical rib and looks like an early 1900’s monograph or something. Middle left- maybe an anterior cervical of Dicreaosaurus ?hansemanni[sic?] because it’s very short and looks like it could be by Janensch. Maybe all of their cervicals aren’t bifurcated. Middle right is Brac… er… Giraffatitan brancai. Elongate, single spine, looks Janenschy. Bottom is Erketu… whatever its species is. Elongate with slight bifurcation and I remember the cervical ribs reminded me of a sled. Great to see some attempts! I won’t say anything in detail about reptilianmonster’s or Mickey’s offerings so far, because I don’t want to give hints to others who might follow, but all will be revealed in due course. Maybe, I need to read more of McIntosh’s papers(The Dinosauria) but heres a guess……….. Lesson I learned here, time to read more about sauropod osteology and morphology. Let me remind everyone that there are points to be had not only for naming the taxa, but the specimens and the serial positions. Trick question! They are all from holiday dinners. Isn’t all of them cervicals? C. Isisaurus colberti holotype ISIR335/2 (mid-cervical C6?) from Jain and Bandyopadhyay, 1997 (figure 4) – that paper originally described it as Titanosaurus colberti. Looks like Nima has beaten me to it. I’ll italicise mine for an extra point! Vertebrae D is from some kind of brachiosaurid… and that is it. Do I get a point? Please! I’m not much of a sauropod person, but I think E is Erketu ellisoni and it’s dang weird.